- Materials can withstand the frost as well, ovens can be set outdoor where winters are cold. - Thanks to the quality of our materials, bricks or concrete cement, your pizza oven will last for generations and will add value to your house. 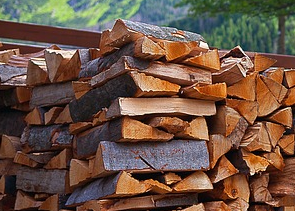 Wood is the cheapest form of combustible material. With its parabolic shape and exterior insulation a Grand Mere oven uses very little wood. Wood consumption is reduced by 30 % compared to a classic design oven. In a Campagnard oven, 10 Kgs of dry wood are enough to obtain a uniform temperature of 300 °C. The Grand Mere oven does not require much maintenance as it is cleaned when you light the fire the next time you use it. Thanks to the 2 baking methods (open or closed door), the possibility to bake bread, pizza, fish, pasteries, to stew or to grill, or to cook on the plancha, you can discover with our Grand Mere oven what the French cherish the most : “le temps du bon”!